The Alameda County Transportation Commission (Alameda CTC) is responsible for the planning, programming and allocation of federal, state, regional, and local funding for transportation improvements throughout Alameda County. The investments approved by Alameda CTC result in a wide range of transportation improvements and services that facilitate safe, efficient and accessible travel for all types of transportation in all areas of Alameda County.The Comprehensive Investment Plan (CIP) brings the vision and goals established through the Alameda CTC’s long-range countywide plans into the near term by focusing funding investments over a five-year programming and allocation period. The purpose of the CIP is to facilitate strategic programming and allocation of all federal, state, regional and local fund sources under the Alameda CTC’s purview. This includes, but is not limited to, federal Surface Transportation Program (STP)/Congestion Mitigation Air Quality (CMAQ), State Transportation Improvement Program (STIP), County Transportation Fund for Clean Air (TFCA), and local sales tax measures and vehicle registration fee programs. The CIP streamlines the programming of these fund sources by considering all available fund sources through a consolidated process that prioritizes, evaluates, and recommends funding to critical transportation infrastructure and operations needs that build and maintain the county’s transportation system. The expenditure and revenue assumptions included in the CIP are updated annually and proposals for new projects and programs are considered every two years as part of a full CIP update cycle. The CIP also serves to satisfy the strategic plan requirements for the 1986 Measure B, 2000 Measure B, 2010 Vehicle Registration Fee and the 2014 Measure BB programs, each of which generates a local fund source directly administered by Alameda CTC. In addition, the CIP serves as the Capital Improvement Program required of Alameda CTC as the congestion management agency for Alameda County. 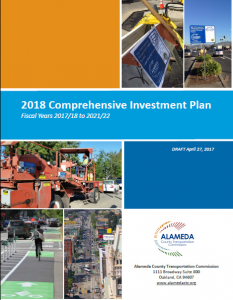 In fall 2016, Alameda CTC initiated a call for project nominations for its 2018 Comprehensive Investment Plan (2018 CIP). The 2018 CIP programmed funding anticipated for fiscal years 2017-18 through 2021-22, including Federal One Bay Area Grant Cycle 2 (OBAG 2) funding. The development of the next CIP (2020 CIP) is tentatively scheduled for summer 2018.